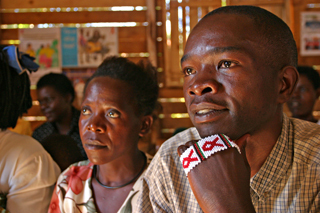 There are currently over 36 million people living with HIV and AIDS around the world. Of these, 95% are in the developing world. As people grow weaker from the disease, they are unable to work, grow food, care for their children and provide for their daily needs. As parents become sick, many older siblings are forced to quit school to care for their younger brothers and sisters. Relatives and neighbours take in orphans while already having many children of their own to care for. Other children are left homeless. Working with partners in India, Malawi and Nepal PWS&D is supporting people living with and affected by HIV and AIDS. PWS&D programs aim to teach people how to prevent the spread of HIV and AIDS, while providing testing, treatment, counselling and care for those living with the disease. Pastors and lay leaders are taught how to provide pastoral care and promote social acceptance. PWS&D works with other church organizations to promote the role of men in the struggle against HIV and AIDS, and to promote the rights of those affected by the disease. Patients access medical care and nutritional support through PWS&D-supported hospitals, clinics and hospices, and expecting mothers receive medication to prevent transmission of the disease to their children. Home-based care volunteers help people with their daily needs and assist with mobility and strength exercises. PWS&D is helping communities care for orphans and vulnerable children (OVC) by providing scholarships and school fees, as well as clothes and healthcare. Children attend Children’s Corners – centres where they can go to share their experiences, play with other children and receive a warm meal. Writing in memory books allows children to express their needs and enables trained caregivers to better support their development. Youth are learning vocations, such as bricklaying, tailoring, carpentry and mechanics, to help find employment and develop self-sufficiency. Education and vocational training are key to the recovery of children affected by AIDS. Life skills courses allow for discussions on sexuality and HIV, relationships and parenting. PWS&D has information sheets to help you learn more our HIV and AIDS programming.